My Lip Stuff's ultimate mission is to end the suffering of people with chapped lips all across the land. In the process, they also strive to end animal testing and save the environment with chemical-free natural products! I really support companies which are not only use natural ingredients for their products but also environmentally friendly and support a world cause too. My Lip Stuff is one of those companies. They're also supporting other cause such as PETA, American Humane, Mercy For Animals, etc..
What's more amazing about them is : the 500+ flavors of lip balms they have! 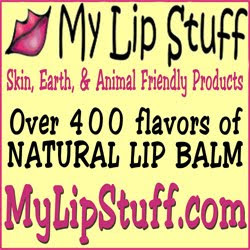 My Lip Stuff Natural Lip Balm has over 500 flavors. 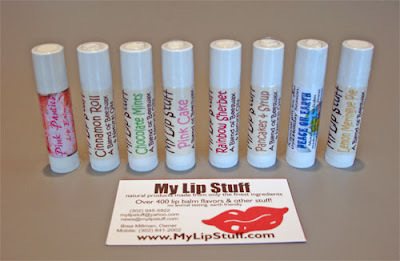 My Lip Stuff lip balm is the perfect blend of butters, oils, and beeswax to moisturize dry lips! Add to that the fact that our company is earth and animal friendly- and you have yourself the perfect lip balm! Over 500 flavors currently available and new flavors added all the time. Special request flavor orders also available. We offer tons of different label choices in different themes-- so there is surely something for everyone. We do offer personalized lip balm, custom label lip balm, private label lip balm, and promotional lip balm too! Okay, now back to the 6 lip balms that I was very lucky to try. They are: Blackforest, Candy Cane, Marshmallow Krispies, Gummy Bear, The Great Pumpkin and Rainbow Sherbet. Yes, they have so many flavors and fun labels from Booze Balms (such as Banana Daquiri or Bloody Mary) to Mood Balms (such as Hungover or Giddy), and a lot of other flavors to choose from. They cover almost anything. I love changing the flavors too. Right now i'm loving The Great Pumpkin, it tastes like pumpkin pie, yum! I also love the candy cane because it has a hint of tingly feeling (like mint), just like original candy cane. I gave the Rainbow Sherbet to my sister-in-law, that's her favorite. It has a sweet taste to it that makes you crave more ^o^ and The Marshmallow Krispies is my brother's fave so I gave it to him (it's actually one of my fave too so I might steal it back from him someday ;p). So if you're a lip balm addict like me, then shop for your lip balms on My Lip Stuff. They also offer custom/personalized label lip balm so you can order a lip balm with a customized label on the tube. This is a great idea for party favors, goody bags or for stocking stuffers or even for Christmas gifts! In 2008 My Lip Stuff donated $760.50 to many fine Charities just through the Charitabalms program so they wanna make 2009 even more charitable! They also have many SALES / COUPONS / SPECIAL OFFER goin' on in their website right now so go ahead, shop the sales! My Lip Stuff is giving away a pack of 6 lip balms (random flavors-can't choose so it's a surprise ^__^). This giveaway will end on Dec 27, 2009 at 24:00 pm. Winner will be announced here on Dec 28, 2009. I did not receive any form of cash for this review and this is written based on my own honest opinion (other people may have different opinions). My Lip STuff gave me the product to be reviewed but it does not affect my opinion on the product. I would really love to try the Peach Belini Lip Balm! I would try the liptint . I am a follower of Two Thousand Things via google friend connect . 2. I am a follower of Two Thousand Things via google friend connect . I follow Two Thousand Things through rss with google reader . I would love to try some of the yummy booze flavors like bourbon or appletini! MMMM! I entered the Pulse Yoga DVD Contest on your other blog! I could never really choose, there are so many flavors! I'd love to try the Eggnog Cheesecake though, sounds perfect! I love tea so I choose Earl Grey! There's so many yummy options! I would love to try the pink cake flavor, among soooo many others. I was already following you on twitter! Lollipops lipbalm in a tube for sure! I am a follower via google friend connect #1. I am a follower via google friend connect #2. I'd like to try the Creme Brulee Lip Balm! Follow Two Thousand Things via RSS. The Blueberry Cheesecake looks tempting. It's rare to find blueberry cheesecake here so a lip balm treat would be great. entered the Bagnesia giveaway in your Tigerlily's Book blog. I would love to try the cocunut rum lippy! mmm I can just imagine how nice smelling it must be! I would love to try the mojito booze balm!! I would really love to try the pumpkin. Love those spices. I would love to try Key Lime Pie! I'd like to try Raspberry :) *Thanks* for the giveaway! I would like to try Peaches & Cream because my favorite fruit is peach and cream must be good :D lol.. I would love to try the geeky mood balm! I entered the Save Your World lip balm giveaway on your other site. I'm a follower via twitter @Angelica1405. Id like to try cat pee! There are sooo many yummy flavors but the one I really want to try is cherry blossom. I'd love to try the Blueberry Cheesecake. I love berries! My email is gienahghurab [at] yahoo [dot] com. I'm wondering what yoga tastes like, so I'd like to try the Yoga Lip Balm!! i'd love to try the Hot Toddy Booze Balm! The Yuzu flavor sounds delightful! I also entered the SnackTaxi giveaway at your other blog. Vanilla Clove in the 100% Vegan Lip Balm sounds INCREDIBLE!!! WOW that is a lot of flavors! I would love to try the Eggnog Ice Cream in the spirit of the season! I entered the Bagnesia giveaway on your Tigerlily site. I entered the Piggy Paint giveaway on your Tigerlily site. Kahlua & Creme sounds delicious. I just might lick my lips right off if I wore that. Unbelieavable to have that many flavors. thanks for sharing & for having the giveaway! I'd like to try the Blackberry Lip Balm (tube)! I would want to get Cat Pee or Dog Poop!! My daughter would get a kick out of that!! I entered Snack Taxi giveaway at Tigerlily's Book! Iam a follower as justscarllet. I would love to try rum and coke! I'd really like the Kissable Mood Balm because it sounds yummy! I'd like to try the hot toddy lip balm or the fuzzy navel...lol Sounds good to me.. Thanks for hosting.. Happy new year! I follow you on google friend connect..